They did it once, and they’re about to do it again on the launch of Battle for Azeroth. 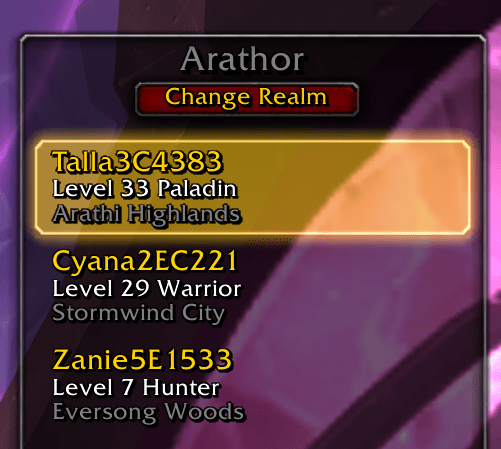 Public Service Announcement: On August 14, 2018, accounts that have not logged into for two expansions will have all of their character names released. For example, if your WoW account played Mists of Pandaria but has been inactive since Warlords of Draenor, all character names on your account will be released to the public when the Battle for Azeroth launches. However, straight from a customer representative at Blizzard, even if your account is active right now, characters that you have not touched since Warlords of Draenor will have names released. I lost some character names. Particularly, the first character I ever created. Am I salty about it? Absolutely. I started playing (read: paying) WoW in 2007, played for six years, and took a break for college in 2013. Six years means over $1,000 in subscription fees alone, not including purchasing expansions. When I cancelled my subscription in 2013, I was told that I could continuing paying (playing?) at any time and all my characters would be exactly as I left them. Then, in 2015, the following happened. So, yes. I am salty. The first WoW character I ever created lost her name because I hadn’t logged into her since 2010. I didn’t even know why her name was gone; I had to log a ticket to find all of this out. Even then, I needed three different representatives to give me incorrect information until the truth came out. Was releasing names based on character logins (rather than account activity) absurd? Absolutely yes, but only because they failed to tell players, purposely being as quiet as possible. If all players had known (myself included), they would have logged in, and they wouldn’t have been able to release as many names. Is WoW’s new policy absurd? Absolutely not. Names are harder and harder to get, and users who are inactive shouldn’t be hoarding names. Was WoW’s communication about the policy change absurd? Absolutely Yes. I guess $1,000 doesn’t get you much these days.